HAKAINDE Hichilema will be caged if he is going to attempt to cause anarchy and chaos by rejecting the outcome of the August 11 general elections to make Zambia ungovernable, the Patriotic Front (PF) has warned. The PF was reacting to Forum for Democracy and Development president Edith Nawakwi who claimed that Mr Hichilema, who is UPND president, was not going to accept the outcome of the August 11 general elections if he lost. Ms Nawakwi accused Mr Hichilema of already acting as head of State. PF deputy secretary general Mumbi Phiri said Zambia has had peaceful and fair elections since reverting to plural politics in 1991 and that its leadership transition had always been peaceful and smooth and it would be unacceptable for any one citizen to attempt to plunge the country into chaos. Mrs Phiri said Mr Hichilema claimed victory in the January 2015 presidential election long before the counting of the ballots could be concluded and that the opposition leader should avoid the temptation declare himself winner of the August general elections because that would not only be a breach of the electoral laws but would be fanning anarchy in the country. She said in an interview that Zambia was bigger than any individual citizen and that Mr Hichilema should avoid psyching his followers that he (Hichilema) was the ultimate winner of the coming general elections because there were many other contenders in the race. Mrs Phiri said the popularity of the UPND was dwindling and that the ruling Patriotic Front (PF) was gaining dominance in the regions where the opposition political party once enjoyed supremacy. Mrs Mumbi said Government was not going to allow any politician including Mr Hichilema to cause confusion and that whichever leader was going to incite his or her followers to cause political consternation by refusing to accept defeat would have to face the wrath of the law. “Mr Hichilema has been acting as if he has already won the presidency of this country but let him be prepared to accept the results of the general elections when he loses. 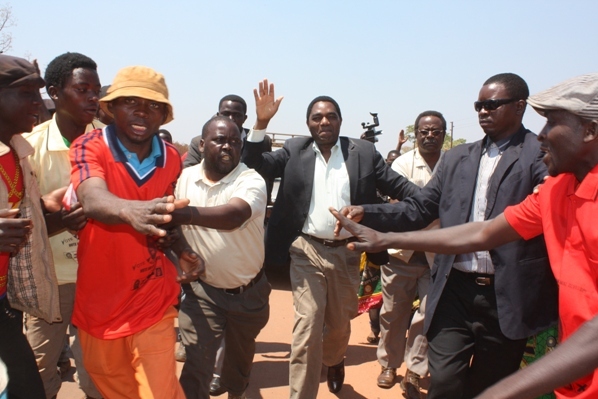 Even in the January 2015 general elections, Mr Hichilema claimed victory long before the last ballot could be counted. But this time, let him know that he will not be allowed to cause anarchy and chaos by rejecting the outcome of the election so that the country can be ungovernable. Mr Hichilema is just an individual and he will be tamed after the general elections,” Mrs Phiri said. She stated that the PF has been praying for peaceful, free and fair elections and that God was not going to abandon Zambia because he was going to give Zambians a leader of their choice. Mrs Mumbi said in 2015, Zambia had no direction as the country during the transition after the death of Michael Sata but with God’s intervention, Zambians went through and had a new President in Edgar Lungu smoothly and without any upheavals. She said the PF had gained a lot of support since President Lungu was elected and that the ruling party was overwhelmed with the number of aspiring candidates wishing to stand on the ruling party’s ticket. She stated that in Southern Province, the PF was having an average of four aspiring candidates expressing interest to contest the parliamentary election and that President Lungu was going to get the best MPs in the coming election. “We are now concentrating our efforts in the UPND strongholds and we shall make sure we get right into their ‘bed rooms’ and get the maximum votes from them. So Zambians should not be worried that there shall be chaos after the general elections,” Mrs Phiri said – Daily Nation. If PF was smart enough by now they could be thinking of changing the party president, Lungu has lost it, only the ones who are benefiting from the ruling party will vote for pf otherwise it’s better to try someone else. In this instance none other than HH. 1. The PF was reacting to Forum for Democracy and Development president Edith Nawakwi who claimed that Mr Hichilema, who is UPND president, was not going to accept the outcome of the August 11 general elections if he lost. 2.Ms Nawakwi accused Mr Hichilema of already acting as head of State. So the entire pf is responding to what the other opposition member is politicking about the other opposition president.? Is Nawakwi now an official spokes person for HH? Why is she not accusing HH of selling the mines?Food for thot! Mama Nawakwi,cool down.You will need HH more than pf after August 12th 2016. By the way you are not a factor in this year’s election.You have overated your self.JUST SHUT UP! Edgar Lungu will be caged if he just TRIES, I repeat just TRIES using his agents at polling stations, to rig elections and loses. All those who will have helped including defence forces and Zambia Police will be caged soon after victory with him. The situation is 50-50 just to be polite when actually HH is winning in the first round by 72% of the vote. Tizakwapula Chagwa in first round. Akangiwa kuteka. So be careful bane because things are not as obvious as always. Rigging is a treasonable offense and EL will not be there to answer for you. How can PF win with an epileptic visionless person causing all this misery among citizens. If they try to rig we shall cage them and will regret their actions. Abash rigging minded PF. Both Nawakwi and Mumbi are just prostitutes.Who do they think they are?Nawakwi is bitter cos she thot lungu would plead for her”wagunwa”They should realise lungu has Esther.leave your friends husband alone imwe mahule atase. God, Help Zambians by Giving Us Hichilema as Our President This Year and Not What These Thugs and Prostitutes are ill wishing for thier Drunkered, Lungu. Insipid article! Shame! Reacting to Nawakwi’s diarrhea is foolishness, that husband snatcher, now busier with Antonio everywhere – the party for two, eish… my foot!!! Us voters ain’t foolish, we know Edith is in bed with pf, and they all come out hallucinating on HH, and stunned it’s only UPND that’s ever growing as opposed to their nose-diving party fortunes. HH is next president, if it crosses your IQ – hang yourself!